Safety is among our core values. Safety always comes first. Conducting our business with respect and care for people and the environment. Continually improving our safety, health and environmental performance. 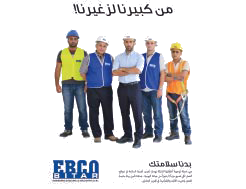 Our Occupational Health & Safety Manual is intended to protect the organization’s employees, subcontractors, owners, and the general public from any work related accidents, and its properties from any loss or damage as well as protect the environment in compliance with customer requirements and related laws and regulations.